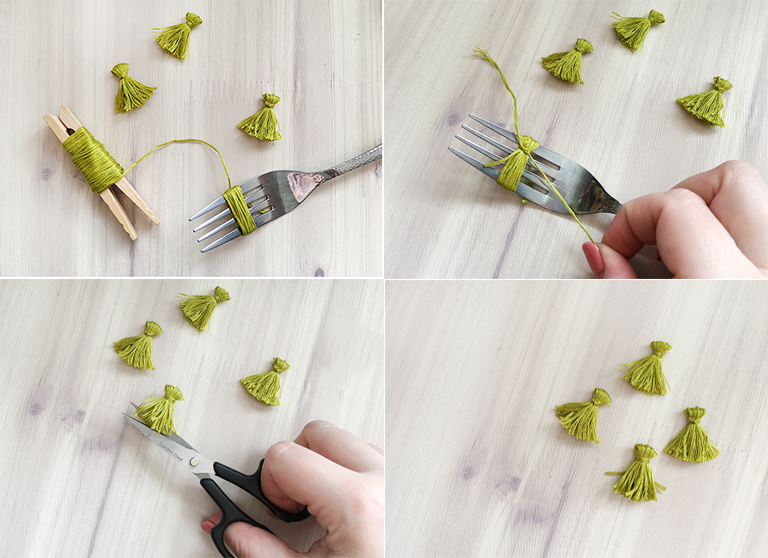 Here is how I make my own mini tassels. You will need a fork, embroidery thread and sharp scissors. 1. Start by wrapping the embroidery thread around the fork, if you want them all to be identical count the number of times you wrap around. 2. Take a length of thread and wrap it around the body of the tassel and tie it tightly. wrap it around a couple more times and tie it once more before cutting off the excess. 3. Slide the tassel off the fork and snip the bottom loops open. 4. Trim the bottom edge of the tassel to neaten it up. 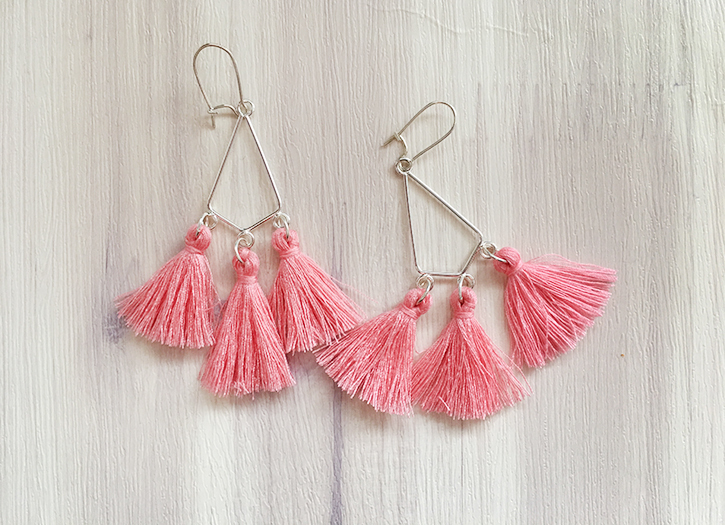 So once you have your tassels ready you can make yourself some earrings. 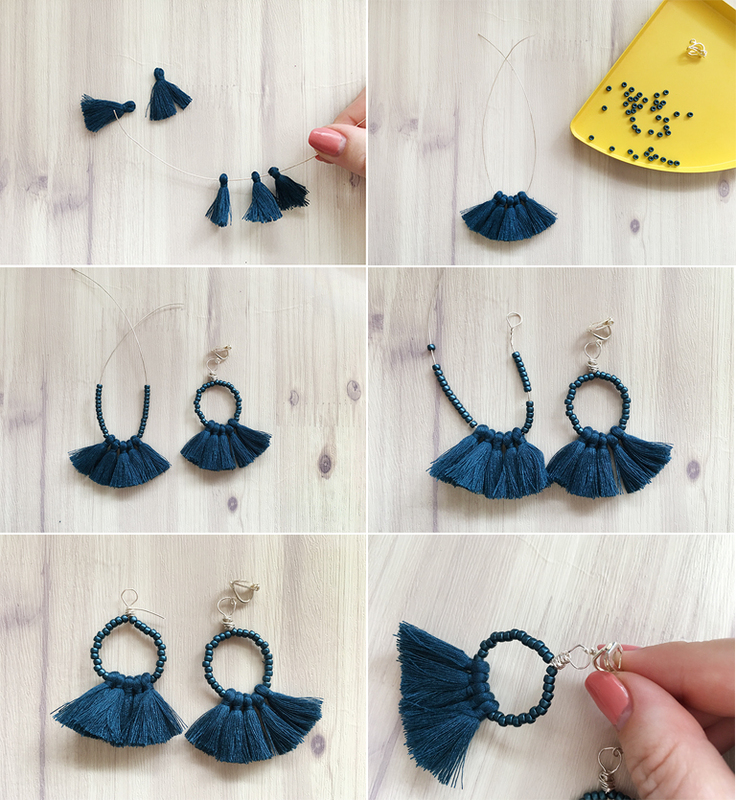 To make some beaded tassel earrings like the navy ones above you will need, 10 mini tassels, wire, beads, earring findings and a pair of pliers. 1. Take a small length of wire about 15cm long and thread five tassels onto the centre of the wire. 2. Loop the wire in two and start to thread your beads onto the wire. 3. make sure you thread an equal number of beads onto each side of the wire, I have used about 14 beads on each side. 4. Make a small loop on one side of the wire and twist it underneath to keep it in place. 5. Take the other side of the wire and wrap it around the bottom of the loop you just made and cut off any excess with your pliers. 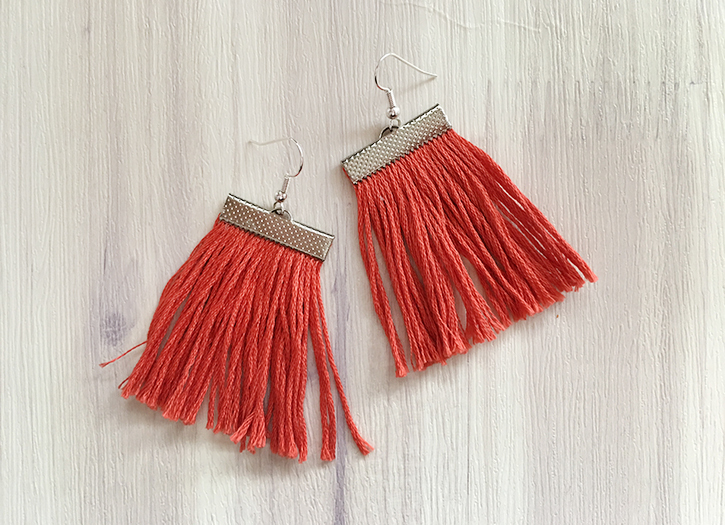 6. loop your beaded tassel pieces onto your choice of earring finding and trim your tassels to make sure both earrings match. 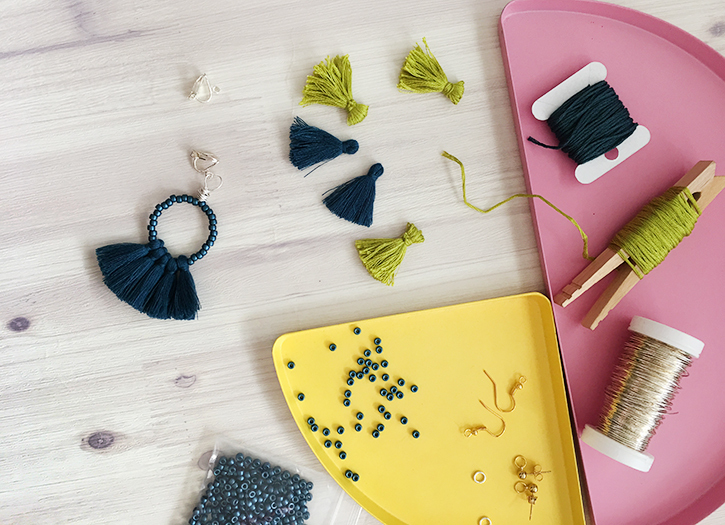 Once you have nailed making your own tassels and you have some jewellery basics under your belt you will be addicted to making these I guarantee. 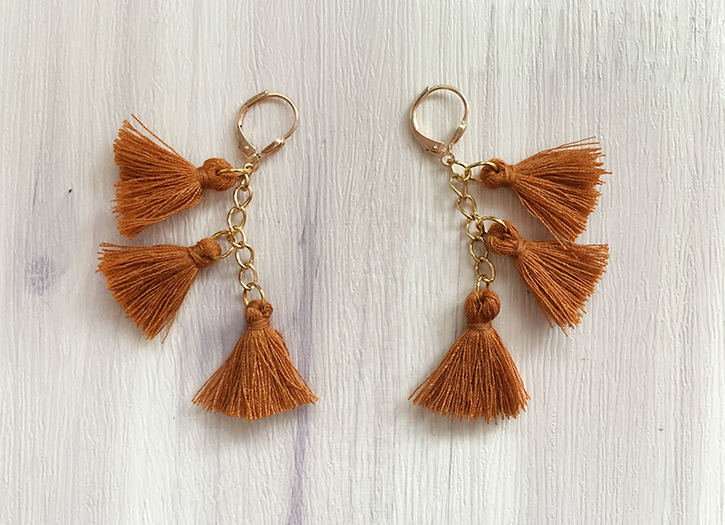 These ones are made by looping jump rings through the tops of the tassels and attaching them to small lengths of chain. 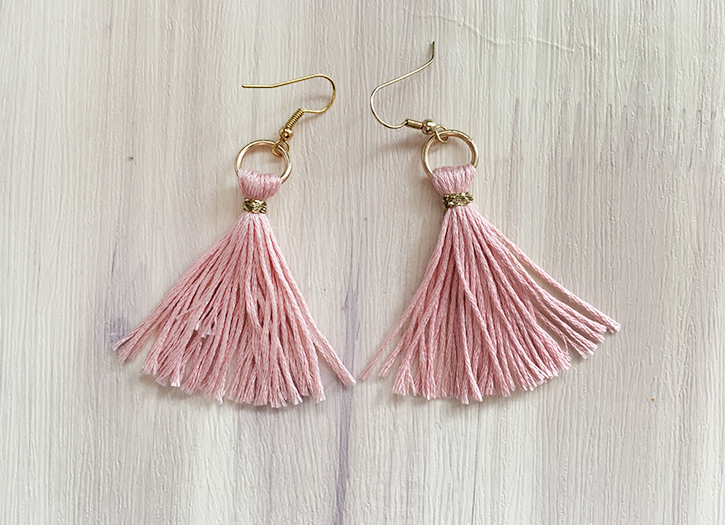 With these, I made longer tassels using a piece of cardboard instead of a fork and used gold thread to tie the strands together. I had an old pair of bead earrings that I dismantled to make this pair, I liked the wire shape so I just replaced the beads with tassels. These were made with ribbon end findings that I had in my stash. I again wrapped the thread around a piece of card then glued them into the ribbon ends before removing the card and clamping them closed and snipping the ends to the length I liked. 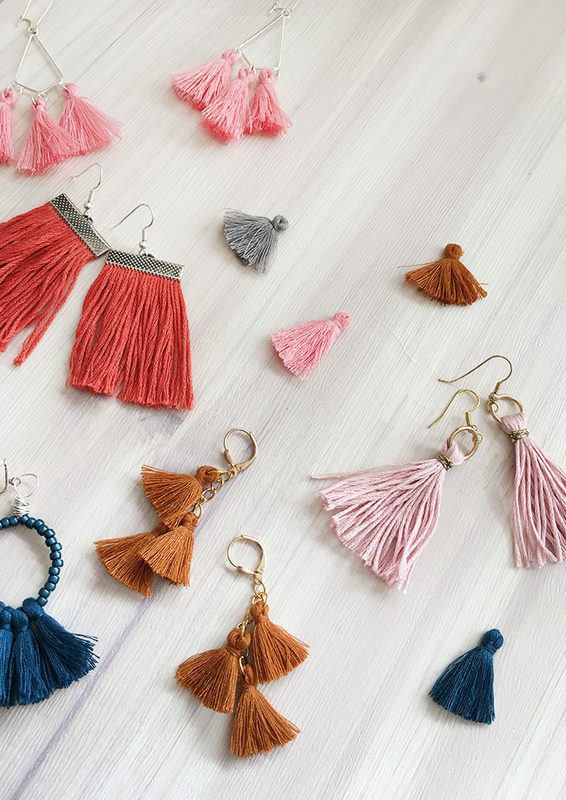 So there are a few different ways to make tassel earrings. I would love to see if you make some of these. I can't wait to give a pair to each of my girls this Christmas, it will be so much fun to wear them at our festive meal out, I, however, will be wearing mine all the time until then! Wow, so creative!! It looks so simple, but super nice. I haven't thought about them before. Thank you very much for your sharing!